WordPress is the most popular content management system in the world. It started out as a platform exclusively for blogging, but has grown and advanced significantly over the years. As of January 2015, WordPress was used by more than 23.3% of the top 10 million websites. 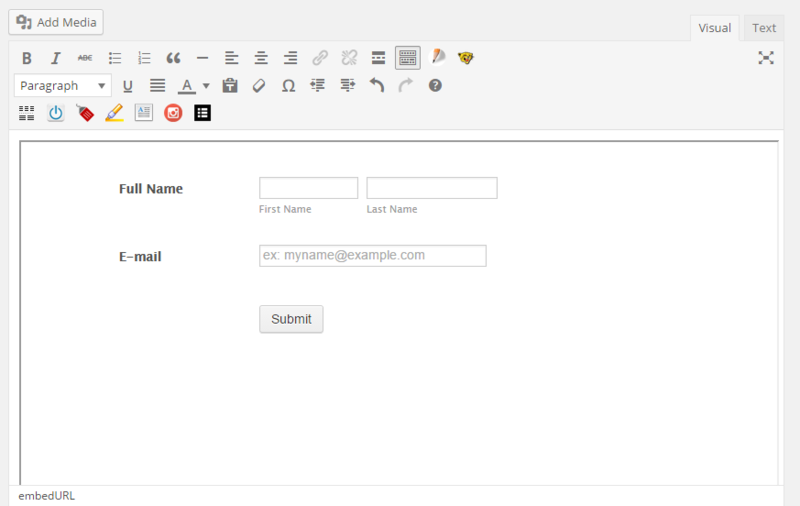 Using WordPress Embed Form Plugins. For hosted WordPress.com users, using the embed method. 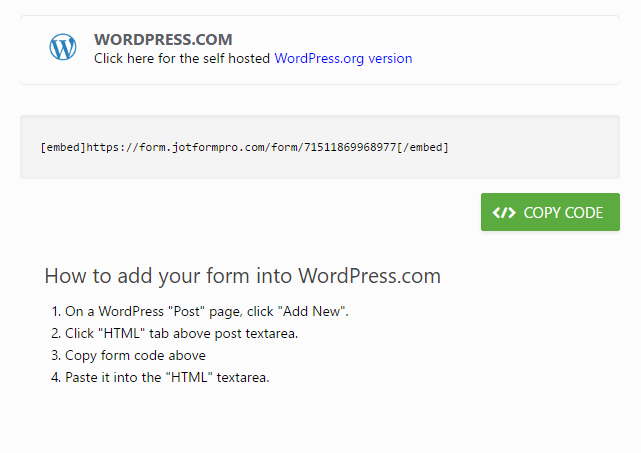 For WordPress.org users, you install our embed form plugin, and then use shortcodes to embed the form. First install the plugin: https://wordpress.org/plugins/embed-form. c. Search for “Embed Form” in the search bar. The developer that will appear should be the one from ‘Ertugrul Emre Ertekin’, our CTO. f. In your WordPress post/page, you will see the JotForm “pencil” icon. 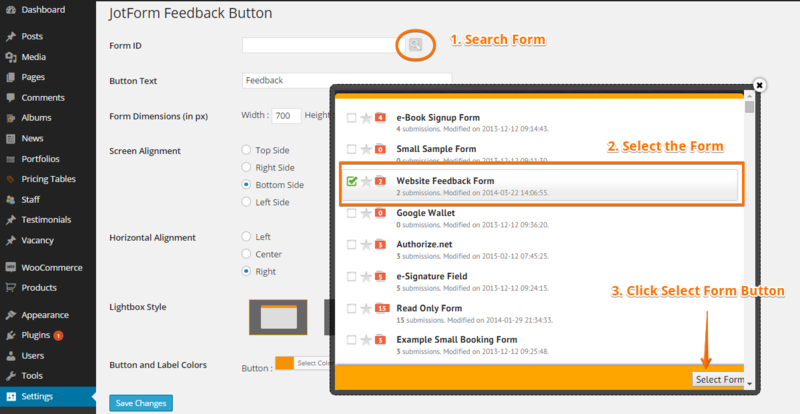 So long as you are logged into your JotForm account using the same browser, clicking the icon will popup a window where you can select the form you’d like to embed. 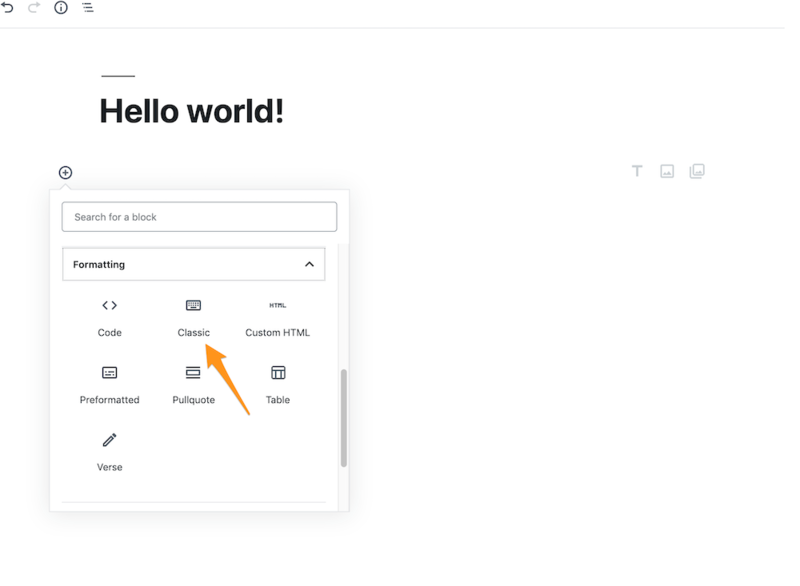 Note: If you are using WordPress's latest editor, Gutenberg, you must add a Classic block to your post or page to be able to add a form using the JotForm icon. h. Save the page and that’s it, the form is now embedded to your post/page. We also have an oEmbed Plugin: https://wordpress.org/plugins/jotform-oembed/. Simply install the plugin by following the same steps above. 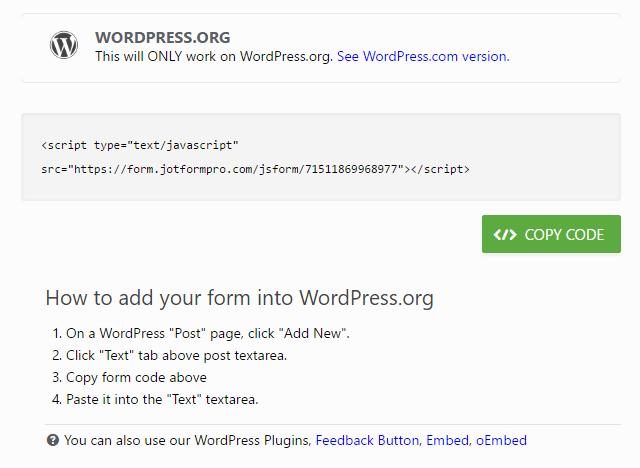 Paste the form URL in the WordPress post/page and the oEmbed plugin will automatically detect the form and embed it to your page/post. If you prefer not to use a plugin, you can also embed the form to your post/page using our embed methods. 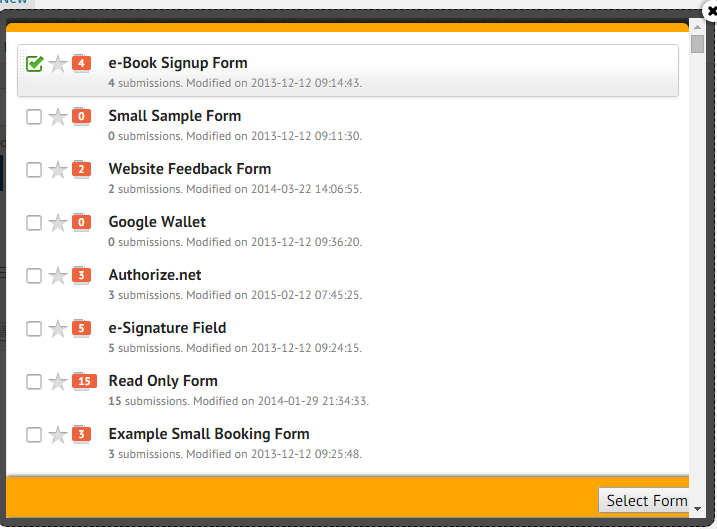 In the form builder, click “Publish” button. Open the "Platforms" tab and search for Wordpress. Select which WordPress from the list is appropriate in your case. If your website is self hosted using "WordPress.org" files, then follow the instructions listed under the WordPress.org option. In your WordPress post/page, click “Text” option. Paste the embed code. For WordPress.com hosted websites adding a JotForm form is as easy as placing [embed] tags around your form's URL within your post. Or you can follow the steps mentioned in the publish wizard, make sure that you are seeing "WordPress.com". If your intention is to only have a form on the page, simply copying and pasting the URL on the post body is also enough. Wordpress.com will turn it into an embedded form. And that’s it for WordPress.org self hosted and WordPress.com hosted websites. I have you any further questions, please feel free contact us on our support forum. As a long time Jot Form user, I find that I cannot get the plug in to work on Go Daddy hosted Word Press. In installed it and activated it, but it does not show up where it should. Now I'm stuck with either their inferior product (2 forms that they made) or paying for a product that isn't as good. I sure wish you had kept up with Word Press so your users can keep using your good product. Neither plugin has been updated in two years, nor are they tested with the current version of WP. I attempted to install the Embed plugin and whenever I clicked on the pencil it said File not found. Will either plugin be updated to reflect the current version of WP? Is it possible to send info through the wordpress plugin? I've tried [jotform id= "XXXXX?id=passedinfo"] but it's not working. Any ideas how can this be achieved? stripe integration isn't working with form embedded in wordpress.com - https://rudemechs.com/offcenterteens/ - it just hangs at "please wait" after you hit submit. the action in the form are disabled.